There was a time when Big Sis would lull her sister to sleep by telling her what to dream. I don't know if they still do this - I'm guessing not. It was such a sweet thing. Giselle Potter is better known as an illustrator - one of my favorites! - but this is one she wrote. Tell Me What To Dream About is about two sisters, and yes, the scenario is very familiar to me. Tell Me What To Dream About by Giselle Potter. Two little girls are in their beds. The youngest turns to her older sister. "Tell me what to dream about or I won't be able to fall asleep," she pleads. The older sister is full of darling suggestions, each playfully depicted on the page. Yet the little sister turns each one on its head, already certain how each dream could become a nightmare. Eating waffles for breakfast is a boring dream, so the sister suggests "having teeny-tiny waffles with teeny-tiny animals." The little girl imagines animals stampeding across her plate. Wouldn't frolicking about with teeny-tiny animals be fun? No, thinks the little girl. She doesn't want to be a giant! What about a furry world, where everything is furry? Their house, their clothes, their friends. No, says the little girl. Furry friends are scary. The older sister comes close a few times, but the little one is a bit of a contrarian. In the end, we're back to waffles for breakfast. And two very sleepy sisters. You can read a bit more about it on Giselle Potter's blog. It's an enchanting book, and one we obviously relate to very much. I also wanted to share one more favorite bedtime book with you. 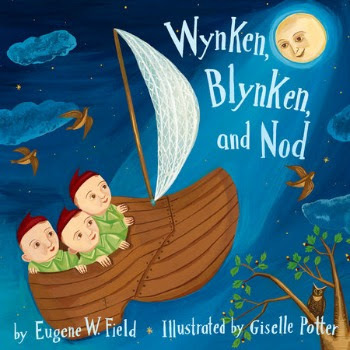 I adore Eugene Field's gorgeous poem "Wynken, Blynken, and Nod." [See here and here.] Little Sis turned one in 2008, and for her birthday, she received the loveliest new picture book of the poem. This was my introduction to the art of Giselle Potter. Sadly, Penguin Random House has the book listed as "Out of Stock," and the Amazon listing leads to me to believe it's out of print. Such a shame, as it's so beautiful. I have one more "dreamy" book to share with you tomorrow, and because I missed Monday, I may have a little something for Saturday, too. Oooh! I havent seen this yet. Thank you! I love her sisters books. And that is so sweet that you have seen that plot in your own home. One of My all time faves is Chloe's Birthday! Oh my goodness! I don't think we've read that one, and I thought I'd checked them all out. Our library has it, so I just put in a request. Thank you! Your gonna go nuts. Its amazing!